Toronto FC 2-1 Sporting KC – Organised TFC cut the strings from puppet master Zusi. Ryan Nelsen made one change from last week’s loss in Vancouver with John Bostock coming in for Kyle Bekker, who spent the week in between suffering from the flu. Hogan Ephraim took Bekker’s spot behind Robbie Earnshaw with Bostock coming in on the right, shifting Reggie Lambe to the left. Kansas City boss Peter Vermes kept the same XI that came from behind to win 3-1 in Philadelphia on the opening weekend. It is one thing for a coach to talk about the need for his team to be organised and defensively solid, it is something else for the players to go out and do it. On Saturday Toronto FC, against one of the league’s best teams, did exactly that. How? The move to a four band system has been essential to their improvement at the start of the season. Toronto are effectively playing a 4-4-1-1 at the moment with their wide players playing very deep. The fact it rarely turns into a 4-2-3-1 with the ball may be an indictment on the overall quality of the players but is also a sign that the players are coach-able and willing to stick to what they are asked of. Playing with two deep banks of four has many disadvantages and can lead to an onslaught by the opposition if they pass the ball well and find gaps in the channels between them. However, despite their second half dominance, the visitors struggled to find space for their playmakers thanks to a combination of a poor final ball and good solid defending. Playing on a difficult surface this early in the season means it was always tough to press as a unit throughout, but crucially Toronto FC put the plan in place to ensure the four band system was flexible. KC’s back four took the first four spots in overall pass attempts but Ephraim and Earnshaw still intelligently pressed the back four, which led to the first goal, while Jeremy Hall and Terry Dunfield worked well as a unit pressing and covering space at the same time in central midfield. Graham Zusi is a fine player and finds space better than most in this league. Zusi, usually deployed on the right, loves to work overlaps with his full-back, Chance Myers, but more than anything he loves to come centrally to pull centre-backs out of position. On Saturday he had a difficult time doing any of that. Vermes started Zusi in his usual spot on the right as he and Myers went up against Reggie Lambe and Ashtone Morgan in an interesting battle on the flanks. Lambe, who was very good defensively in Vancouver, was impressive again in this area despite a move to the left. Myers and Zusi’s attacking tendencies will always put their opponents on the back foot but Lambe stuck to the plan well, playing narrow to show his opponents the line and often shielding Morgan from Zusi’s movement. Earlier in the first half here is a good example as to why it was important for Morgan and Lambe to work well as Zusi and Myers break by them…. You will notice at the bottom of that image that this move got Nelsen up off the bench. Thankfully, for him, it ended with a wayward pass, something too familiar for the visitors. In total Zusi and Myers lost possession 42 times in the game, with a combined pass completion ratio of only 70% (76 of 108). Lambe wouldn’t make the same mistake twice…. Zusi played the first 38 minutes on the right, the next seven on the left until half-time, the first eight minutes of the second half back on the right and then the rest of the game on the left. He finished with 11 successful crosses from 14 attempts and although that number is too high it is a sign that he was unable to influence the game deeper. Zusi only attempted five crosses against Philadelphia the week earlier yet had much more of an impact in the game. Toronto’s full backs Richard Eckersley and Ashtone Morgan both kept their concentration levels high up against Zusi closing him down and forcing Sporting KC to look elsewhere for intervention. 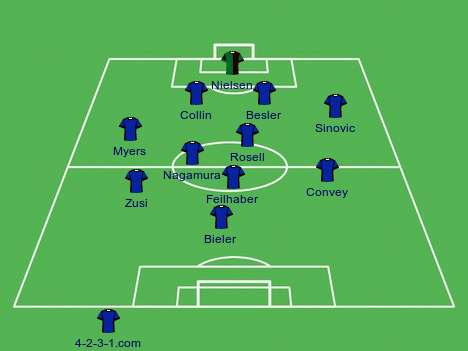 In the second half, with the American international now on the left, he comes from a deep position and Eckersley follows him rather than the onrushing full back Seth Sinovic who he knows won’t receive the ball…..
Eckersley is proven right as Zusi comes centrally still tracked by the right back…. The move would break down again. Although Sporting KC were the best team by far in the second half, scoring a goal on the break to cut the deficit. However, by taking away Zusi’s vision and intelligent running, Toronto forced the visitors to play a more direct style that suited them. Nelsen’s team are no where close to what he wants them to be personnel wise but such a performance tactically so early into his rookie year as coach is very positive. Toronto travel to Montreal this Saturday to play a team who are the talk of MLS right now after impressive wins in Seattle and Portland. I will be sure to have a post later this month on the Impact. Sporting KC host Chicago in their home opener. Expect Zusi to be back pulling strings.